From retail and commercial banking to wealth management, insurance and investment banking, mobile technology is transforming the way people handle their finances. Growing numbers of American consumers use their mobile devices to manage their financial lives via online portals and mobile apps. In response, the financial services industry needs to change: 70% of IT leaders say tablets and smartphones will ultimately replace PCs in financial services, and 60% say they are strongly committed to expanding the use of smartphones, tablets and mobile-enabled printers. 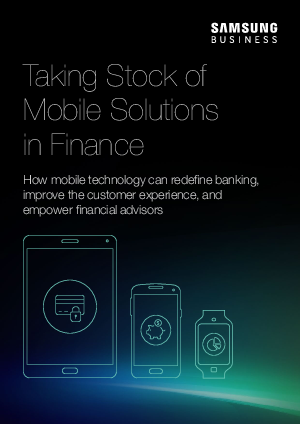 The shift to mobility can free banks to reinvent traditional bank branches and financial advisors to reimagine workflows to better serve mobile customers. IT professionals face the challenge of integrating mobile solutions with their existing infrastructures to improve the way customers engage with their financial institutions. This eBook runs the numbers on some cases where mobile solutions are not replacing banking, but revolutionizing it – making it faster, easier and more satisfying for customers to oversee and manage their day-to-day finances.